Let us be thankful to Allah for letting us pass all subjects this semester. now we can safely move on to the final step. cant believe it. anyway, congratulation people! let us celebrate once semester 1 started. Saya nak beritahu semua orang yang setiap kali saya memandu jauh dari rumah atau UIA seorang diri mesti saye sesat. mase balik dari PWTC dulu sesat sampai PJ baru dapat balik umah. hari ni, nak g IKEA tapi jalan jam jadi saya patah balik and singgah Cheras Leisure Mall. tapi nak g CLM pun sampai dua kali salah masuk jalan (ini setiap kali nak pegi sana aku mesti buat sesat yg sama) pastu ade ke patut aku nak masuk MRR2 mase nak balik umah tadi ta[i termasuk jalan hape tah, pastu sesat sampai Bangi baru leh sampai umah. aku tekanan dengan diri sendiri sebab kene tol sampai RM1 x 3 = RM3.00. pastu minyak lagik. menci betol la. padehal aku ni dahlah independent. tak cool la asyik sesat jek. grrrr. okay, takpe, lupekan sume ini. esok, hari yang sungguh sebok. Gerald dah amik half day leave just to go out with me to the warehouse sale. but i received a call from a legal firm to come for an interview tomorrow. i am so hoping i can (no, i must) make it to see Gerald or i am dead. i'll freak out at myself again if i couldnt make it. i think i'll make it. thats life. everything must happen at the same time and sometimes nothing happen at all. okay, flat aku (sebenarnye flat mak aku) sudah siap dipagari dengan grill. ciri2 keselamatan sudah lengkap. besok atau lusa mak aku akan pegi kedai lampu dan beli lampu sambil memastikan servis pemasangan pun available sekali. ini kerana adik lelaki aku merangkap technician keluarga sedang menjalani final exam. aku buat pertama kalinye sudah melihat flat tersebut pada hari ini. aku cukup berpuas hati dengan keadaannye. tidak terlalu besar atau kecil bagi orang bujang mcm aku nih. hehe. besok aku bz, jadi maybe lusa aku akan kesana dan menjalankan proses pembersihan. aku dah beli pencuci lantai anti bakteria di Giant tadi. lepas tu, aku akan berpindah masuk. sekarang aku dalam proses nak iklankan bilik untuk disewa. yela, takkan aku sorang2 jek dok kat situ. walaupun aku sendiri tak kisah tapi eloklah aku tak dok sensorang kan. ciri2 housemate yg aku nak: practicing Muslim, pakai tudung, tutup aurat, female, hygenic. sekarang ada dua bilik kosong. dekat dengan stesen komuter serdang. sape2 yg berminat sila emel aku takpun letak je komen kat sini. haha. oh, sewa aku tak decide lagi tapi sebijik rumah between rm450-550 je kot, jadi pepandai la bahagi sendiri. bilik ada tiga tapi master bedroom of course aku yg punye. 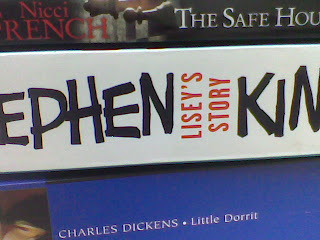 went to PWTC book fair yesterday. did a lot of damage to my savings. 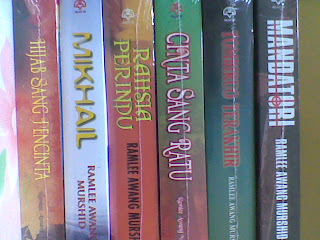 i am now announcing that i have ALL Ramlee Awang Murshid fictions. not only MIkhail. but i have ALL OF THEM. yes, i am that crazy. spend RM100++ at the book fair. 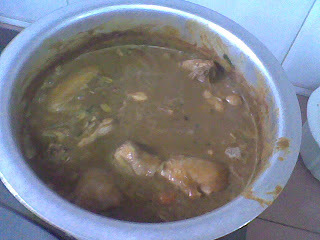 i left my pendrive at home, so i couldnt upload pictures of my 'damage'. currently having 8 newly bought and unfinished books. on top of that i am planning to do another damage to my account by going to MPH warehouse sale next week with Gerald. i hope those books that i want will be there. take my advice. buy Malay or local books in PWTC. for English books, go to MPH warehouse next week. see you there, or be square. its quite boring to write a blog offline. but i have to make do with whatever i have. so, i've already lost track of date and day. I am not sure how many days we're in semester break. haha. i know its still early though. first day of holiday, spend my time driving alone into bukit bintang and visited christian dior warehouse sale in coronade hotel. i almost got myself a RM170 perfume. somehow along the way i lost my interest. so i didnt buy that perfume. then i just walk, window shopping to and fro bb plaza, sg wang plaza and lot 10. bought myself a cloth at FOS. got to my mahallah in the evening and start packing real fast. my bro came at night and we load the Ford Ranger until its full. I dont give a f**k about the prohibition of bringing male into the mahallah. i've tried asking for permission in a legal way but they didnt entertain me. seriously, how can they expect all the girls lift all those heavy boxes. nope, i am one who will do whatever i think is right. so i told my bro to lift the boxes from level 3 to the truck. send him off that night and continue packing. the next morning i load the Gen2 until its full, send my keys and off we go to Serdang. imagine, two fully loaded Ford Ranger and Gen2 is my stuff. yet they expect me to carry it myself. total BS. at my parents house, all that stuff cannot fit in. i told my mother that i seriously need another place to live. so we agreed that she should make her flat nearby south city plaza available for my accommodation. the plan is, i will live there and i will let out the rooms (other than master bedroom, of course). i dont want to get all so excited about it. although i love to live anywhere but here (hehe). the windows and doors had already been measured and some people are coming this saturday to put up grills on the said door and windows. well this is Malaysia. we have to put up those grill. currently my stuff is out under the porch and some of it is in the living room. cant wait to have so much money to design 'my flat' like a designer. tehehehehe. i'm thinking dark brown like oldtown white coffee. or purple like what i saw on tv. haiiih....daydreaming. on Monday, i went out in the morning and drive around Serdang meeting my old employers asking for the same job and some new ones. up until now, no news. I dont remember what i do on tuesday. lol. on wednesday, went to Alamanda to find job. there are some vacancies but i dont like retails. if i want to work in retails i might as well help my aunt. that way i wont care about the skimpy pays so much. on the same day i planned to go to PWTC bookfair. i was on sg. Besi highway when a motorcycle honked me. they told me my front wheel is on smoke (not fire. haha). so i pulled up beside the military airport. then my father and bro came and a short while later a lorry came.but before that another bike came and offered to repair. my father also refused. anyway, lots of things happened on Wednesday. after we came back from picking me and Gen2 back from the highway, i followed my parents to Balai because yesterday my sister hit a bike with Ford Ranger. my parents arent so ignorant about the law, but we are dealing with the vic and her family who are so ignorant. i am GLAD i took law. because all those drama and theatrics happens (malas nak cerita drama dia) because they are ignorant. in the end, after some free advices etc, i drafted (again, for free) a settlement between my sister and the girl in front of the investigating officer that the matter is settled without investigation and we will pay all the damage to the bike of RM194.00. all signatures were put and its settled. the IO read my settlement and was very satisfied (we never told anybody there that i took law). i saved everybody RM300 of compound and my sister's neck. how convenient is that? no wonder people hated lawyers. they are afraid of the things that they didnt know. afraid of our knowledge. fyi, i didnt come there to save anyone. i came because i want to see how useful i can be. to prove myself to me own self. heck its true, KNOWLEDGE IS POWER. 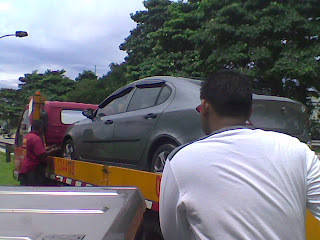 today, i'm still waiting for Gen2 to be repaired so that i can catch up with PWTC bookfair. i just wanted to buy Ramlee Awang Murshid's Mikhail. 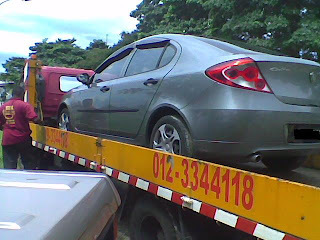 i hope its still ongoing by the time the car is ready. 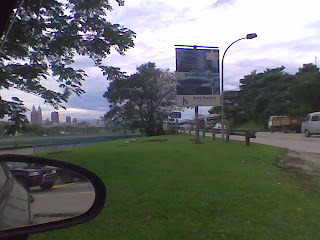 on 28th planned to go to MPH warehouse at PJ with Gerald. other than that is the usual, watchi9ng tv, play games, made my kid sisters life miserable, picking them to and fro the school and kindergarten etc etc etc. mundane stuff that doesnt need reporting here. next on schedule is moving out of parents house to the flat. unpacking etc. after all is done and if i didnt have a job to detain me i wanted to go Cuti-Cuti Malaysia in Penang. our family planned to go to Bt. Ferringhi. but there might be chance that i'm going earlier to visit Fiza. 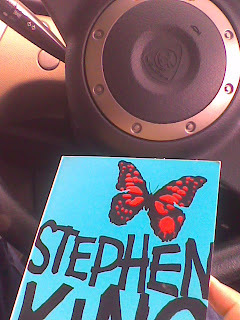 p/s: i am now on my way to PWTC to get that book coz the car had been repaired. well, i am still not in a bored mood as yet. there's a lot to do and a lot of things is happening around me. whats news? 5. will rent out room. those two last papers was really tough. I wont be surprised if for the first time I'm going to retake a subject. talking about being a repeaters, i have this ex-friend who repeats papers. Recently, she called me a bad muslimah and not amanah. well, i kinda dont get her definition of good muslimah or amanah. because my informers told me she skipped classes and tutorials, didnt do her course works, even had the gut to tell my friend to lie to a lecturer because she have not finished her work. that aside, how can a good muslimah and an amanah calls another person as not? Sure, i am defective in every ways. but haha, i dont think i am as bad as that. so what i'm thinking is i might be nearly on the same level as her when i do repeat a paper. heck, how can an amanah person and good muslimah repeats three subjects? here's what i want to propose. if i do repeat subject next semester i'm gonna believe you that i am as stupid as you. trust me, i am really degrading myself here. I really do not hate you. I just hate your stupidity and am allergic to it. haish, how can i be so sharp. but in return, i am allowing you to revel on my downfall should i really fall next semester. btw, i have a nickname for you: MUSLIMAH. thats a good name lah. may u REALLY WILL turn out as a MUSLIMAH. (amin). like they said, love your enemy (though u arent) and they'll hate you for it. i repeat, u're not my enemy coz just dont flatter yourself kay, i am my own worst enemy. why this sudden reference to this Muslimah? well, just now after exam i was really scared and feeling like a mountain is sitting above me. suddenly, out of the blue our faces met and we looked into each other's eyes. and i am like: YA ALLAH IS THIS MY FUTURE LOOKING BACK AT ME? yeah baby, this is what will happen to you if your result is bad. I wanted to breath fire. and you just happen to be right in front of me. btw, please read my disclaimer if you dont like what you read. lol. There are some people that i know that i believe are holier than me. and i dont resent it. in fact, i admired them. i have no problem against people that are holy or whatever. I have a problem against people who are not aware that they might be beneath me. Perhaps i am saying things harshly. However, i have always behave rightly in my social life. I acted according to my principles. some people may say that i am blunt, brutally honest, brutal, scary, intimidating and etc etc. But not one of it involves me taking anything from anybody. I always believe in placing things in its rightful place. what i take is what i interpreted as mine to take. and i was never jealous of other people about what i dont have. because its not mine to jealous about. In short i dont understand why people acted dramatically towards me. whereas i hated drama the most. i live my life to avoid drama. Only Allah knows how tired i am of the drama of my life. I seem to be repeating myself here, but when i disagree with something i say pointedly about what i disagree about but when nothing change i walk away. simple. no drama. Soooooo, the exam is over. as usual, I (and you) only realized what we have been studying this whole semester those 24 hours before the examination. Makes me wonder whats the point i've been attending all those classes and missed a lot of sleep and fun. I mean, we totally can just dont go to class, consult lecturers only to receive tutorial questions, or assignments etc etc for our CAM. but we totally CAN DO IT without classes. Its totally archaic to go to classes. we dont even have much LECTURES but we go to CLASSES. The only difference between this place and my old high school are: (a) i have to get in and out of different classes after one hour, (b) i can choose my own time, (c) choose the lecturer (teacher? er, how can we have a lecturer when we have class not lecture?) i mean TOTALLY RIDICULOUS. talking bout ridiculousness. As usual, another admin probs that simply wont go away until everyone get up and educate themselves and upgrade their brain. This semester, i had to fully vacate the hostel (mahallah) and not allowed to leave anything in the store. I've been thinking on how to transport all these stuff i have from level 3 to car park. So i get this idea to apply to the mahallah to be allowed to get my brother to help me move out using this old form that i had collected a few semesters back. Today, the staff told me that the form is no longer in use and i am not allowed to bring my brother. I thought about writing some 5 pages of complaint but thought the better of it. all i am asking is one hour for me any my bro clear out the room. !#$@#$@$%@$. will think about the solution later. plus, BOXES, i really need some BOXES. i am too tired to solve my moving out probs right now. I am writing now because i must clear my brain and put it out in my blog fore i can go to bed. CPC I sapped out my free will. Plus, CP I is the last paper. conclusion: I couldnt study for CP I. I have no will to read and remember. Will i get that 9 marks? 2. had a glimpse of my future attending CPC I lectures again. 3. brought in Federal Constitution that had one Article highlighted and another scribbled. I was prepared to create drama moment if they tried to take that FC but that invigilator didnt. Lucky him. my plan: to tear off that highlighted and scribbled pages right there and then. 4. 20 marks burned. nil. blank. no answer. 6. just need 16.5 to pass but with 40 marks.....will that ever happen? 7. Lost the will to write by first page of answer. 8. used 12 pages of answer book but only 9 is actually fully written. Perhaps I will grace CPC I wth my presence again. 1. Modify cheap car to look like expensive car. reason = waste of money, reducing the car's market value. 2. Ramming a car at the car park and ran away. reason = unjust enrichment to the wrongdoer, irresponsibility, selfishness, unjust kemiskinan to the victim. 3. Double parking/blocking another vehicle at the car park. reason = selfishness, delay to other road user, may cause waste of time and money to the victim, victim late to class or exam and couldnt score in exam because of you and then couldnt secure a job, forever you will be cursed by the vic and you wonder y your life is so miserable but cant figure out that you had been cursed (okay, i know this is totally ridiculous). 4. Blocking the traffic in a busy road. reason = lack of mental faculty to measure the size of the road and the amount of cars. mathematical analysis totally out. total retard. 5. Stealing someone else's property or lawful right. reason = selfishness, injustice, evil, cruel, inhumane, please die early to avoid chaos to society. First of all, thank you to all people that deep in my heart i actually love. I am so happy that this year I received birthday wishes from the people that i care. people who are close to me. My first act of denial is to hide my birth date on facebook and friendster. I guess that act gave a good turn because I received messages from people who truly cares. the feeling is mutual. you know who you are. 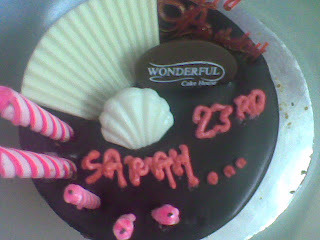 Actually, my birthday is not so special because it always fall during exams or holiday. I didnt get to celebrate with friends. in fact, i dont remember celebrating. however, this year is more special than last year coz i received a cake from Liza after so many years of no birthday cake. i guess i am cake deprived. lol. I also received a blog post in my honor. thanks to kak fiza. hehe. and people, thanks for the facebook messages, smses, blog comment and shoutbox message. In this dizziness of my head and heaviness of my eyelids (sleep deprived, over and done with Pil i), i would like to write about another theory of life that i had just realized. actually this is nothing new. but just for the sake of increasing the anticipation i'd like to add that this is the second time i remember something really funny from my trips to the toilet. the first is also something about trips to toilet. I've just realized that every semester during examination weeks i will suffer this 'toilet trips' (well, i'd like to write something else but i just dont want to ruin my gratitude above. hehe) for many semesters i thought exams made my antibody weak due to anxiety and sleep deprivation etc. today i have a new theory. you know why they made the term 'scared shitless' ? yes, exactly. thats my theory. I AM SCARED SHITLESS DUE TO EXAMS. 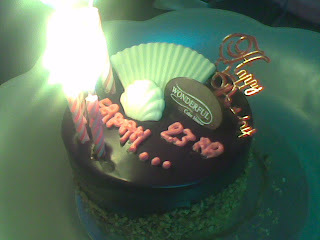 haha, i forgot when was the last time i had my own birthday cake. Was it 6-7 years ago? anyway, this is very thoughtful of Liza. Really really appreciate this. I had a very meaningful day studying for Public International Law I exam on my birthday. lol.